Developed using composite materials for the body, the ComPro is a lighter, more affordable alternative for transit users. It incorporates a cast NdFeB, rare-earth magnet, precisely balanced on a sapphire bearing. The result is a powerful magnet, which seeks magnetic north very quickly and allows for faster readings. Call us for special balancing. 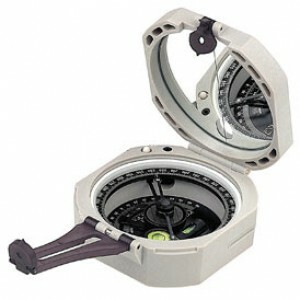 Com-Pro Pocket Transits 0 - 360 Deg. The needle is induction damped, which allows the needle to seek magnetic north and come to a complete rest in a minium amount of time, without accuracy degradation. 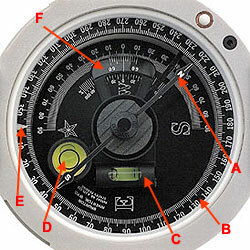 In combination with the needle, the 1° graduated circle allows accurate 1/2° azimuth readings on both the Degree ( 0° through 360°) and Quadrant (0° through 90°) graduated circles. The long level for inclination measurment. Adjust the long level using the vernier adjustment (M). Use the round level to level the pocket transit for azimuth measurement. 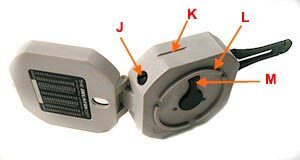 The zero pin is the pointer used for magnetic declination adjustment. If no adjustment is necessary, the pin should point at 0°. The large sight and the attached peep sight are used for precise azimuth measurement. Attached to the cover, the small sight is used for precise bearing and inclination sighting. Located on the inside cover, the mirror and mirror center line are used for accurate azimuth measurements, when using the transit as a prismatic compass. With a screwdiver, rotate the graduated circle by turning the circle adjusting screw. The slots on both sides of the body are for mounting to an optional Brunton tripod. The circular extension with slots, located on the bottom of the body, is for the attachment of an optional Brunton alidade (protractor). Only the COM-Pro models have this feature. M. Vernier Adjustment Use the vernier adjustment to adjust the vernier and long level for inclination measurments. Jual Kompas Geologi Brunton 5008 bahan Fiber dan lengkapi Peralatan Pengukuran, Penelitian Geologi atau pekerjaan survey anda dengan Kompas Merek Brunton Made in USA, Harga kompetitif Tentunya Gratis antar untuk Area Medan dan dapat dikirim keseluruh Indonesia, Jika membutuhkan penawaran harga hubungi sales kami Klik Disini, Permintaan Penawaran Klik Disini. Kompas geologi digunakan untuk mengukur arah (azimuth) pada suatu titik ataupun kelurusan struktur, mengukur kemiringan lereng,maupun mengukur jurus ataupun kedudukan perlapisan dan kemiringan lapisan batuan.